LSBU's Business Solutions Centre, has won the Institute of Enterprise and Entrepreneurs (IOEE) annual award for Enterprising Learning Provider of the Year 2018. 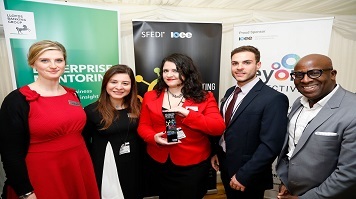 The award was presented to student advisors from the Centre in a ceremony at the House of Lords on 2 May. The Business Solutions Centre allows students to gain consultancy work experience to enhance their studies, by working as advisors to local businesses, providing advice and guidance on a range of business matters including marketing and financial planning. The initiative demonstrates LSBU’s enterprising approach to supporting businesses and students. A total of 26 student advisors have supported over 60 entrepreneurs since the Business Solutions Centre opened in February 2016. All of the advisors have received training to develop their entrepreneurial mind-set, communications skills and commercial awareness. Mike Molan, former Dean of the Business School, said: "We are delighted to have won this award competing against some stiff competition. It is a lovely acknowledgement of the effort invested in the Business Solutions Centre, which brings benefits to both students and local enterprise. We are very proud of all the students involved. "All of the student advisors have been trained and supported by staff from LSBU’s School of Business and Department of Research, Enterprise and Innovation. This collaborative initiative demonstrates how the whole University is investing in enterprise and entrepreneurial development." Other nominees in this year's competition represent a diverse range of initiatives across the UK: New College Durham, Royal Bank of Scotland and The Grimsby Institute. Accounting and Finance student Daniele Nebiolo has been supporting local businesses at the Business Solutions Centre for one year. Find out more about the Business Solutions Centre.